LIVE | #NajibTrial 4.40pm – Wong Nai Chee, the 17th witness, says that he received an AmIslamic cheque for RM238,914 from Najib on Feb 12, 2015. The cheque was for community leader Lim Soon Peng to pay two other entities. 4.40pm – Wong Nai Chee, the 17th witness, says that he received an AmIslamic cheque for RM238,914 from Najib on Feb 12, 2015. The cheque was for community leader Lim Soon Peng to pay two other entities. Wong, who served as Najib’s political secretary from 2011 until May last year, tells DPP Saifuddin that the cheque was used to pay AD Network and Akademi Kewartawanan & Informasi Taima. “Payment was for administrative fees for the Ah Jib Gor Facebook profile (by AD Network), and for the publication of Chinese Weekly, the name of the publication,” Wong says. He says that Lim is a trusted man, and that the objective of Chinese Weekly was to inform Chinese readers. Saifuddin: You say that the payment is for AD Network and Akademi Kewartawanan & Informasi Taima. Have they complained of lack of independence? Wong: No, they have not. In November, 2013, online news portal The Malaysian Digest denied a blogger’s posting that it receives a monthly funding from the Prime Minister’s Department (PMD). Maybe they were not lying then. Today 23 April 2019, the 16th witness in Najib’s SRC International trial, Onn Hafiz Ghazi, who owns shares in the online news portal operator Vital Spire Sdn Bhd, confirms receiving an RM240,000 cheque from Najib on Jan 30, 2015, to run online news portal Malaysian Digest. 4.18pm – 16th witness Onn Hafiz Ghazi, who owns shares in online news portal operator Vital Spire Sdn Bhd, confirms receiving an RM240,000 cheque from Najib on Jan 30, 2015, to run online news portal Malaysian Digest. During examination-in-chief by Saifuddin, Hafiz says that the now-defunct portal covered international and local news regarding politics, entertainment, and sports, among others. Saifuddin: On whose orders did you set up the portal? Hafiz: On the orders of Najib. I met him alone at the Prime Minister’s Office at that time. I received the cheque from him. He signed the cheque in front of me. Malaysiakini previously reported in 2013 that Malaysian Digest had denied receiving monthly allocations from the Prime Minister’s Department. Online news portal The Malaysian Digest today denied a blogger’s posting that it receives a monthly funding from the Prime Minister’s Department (PMD). The denial was made by its editor Onny Izwan Nordin in an email response today. “We vehemently deny the utterly preposterous allegation made in the blog and will offer no further comment,” Onny said in his brief response. Asked whether it would institute legal action against the blogger, he curtly replied, “not at this time”. The blog Peoples Parliament in a posting three days ago questioned the 2014 Budget allocation under the ‘Facilitation’ fund that includes an allocation of RM4 billion. It cited a source as saying that the 2014 Budget for the PMD funds various news portals to disseminate pro-BN propaganda subliminally and cited The Malaysian Digest as one of those receiving aid of RM200,000 a month. The blog further claimed that the person-in charge of running The Malaysian Digest is Defence Minister Hishammuddin Hussein’s nephew, Onn Hafiz Ghazi. The Malaysian Digest describes itself as a voice of reason in supporting various issues, truths and viewpoints and that its duty is to Malaysia and its people. urther leaked documents from the Malaysian enquiries into 1MDB have been made available to Sarawak Report, which indicate that the Prime Minister and his wife utilised over RM1.15 million of the fund’s stolen cash on purchasing hormone-based, anti-ageing products via a clinic in KL! They make clear that whilst the PM is referred to by the Department of Justice investigators at “Malaysian Official 1″, he was dubbed “B1″ by domestic MACC officials, who were investigating cash received into Najib’s personal accounts from the 1MDB subsidiary SRC. Sarawak Report has identified that the recipient of the cheque, which clearly bears the now familiar signature of the Prime Minister Najib Razak, was a doctor and Vice President of an ‘alternative medicine’ society* in KL, which specialises in growth hormone therapy to combat ageing. The man in charge of the society, called the “Sahamm Society for the Advancement of Hormones and Healthy Ageing” is a Dr Selvam Rengasamy. 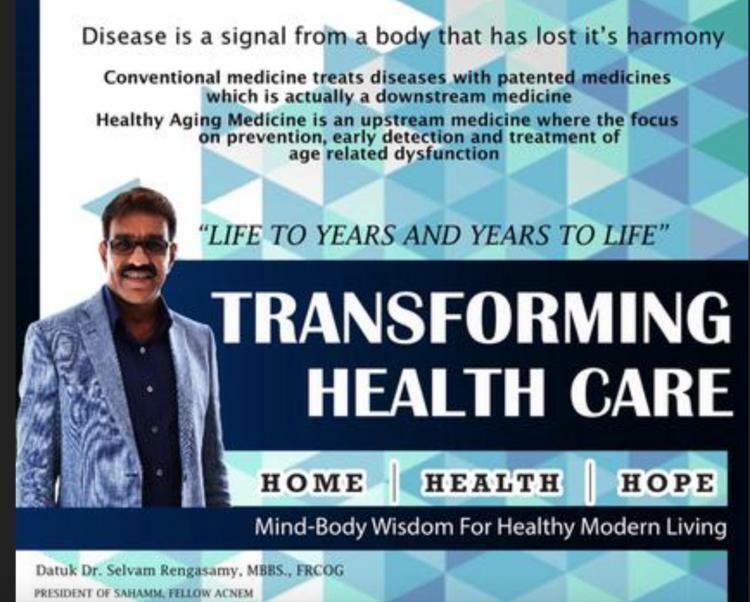 Rengasamy, who is also a Datuk, appears to promote himself as an ‘alternative’ health guru who has found the secret to all health problems and longevity, through cell regeneration. Styled more like a rock star than a doctor he stands by his unusual and highly controversial treatments, which are banned in the US and elsewhere, where they are regarded as an inappropriate and dangerous misuse of drugs developed for entirely different medical conditions. [update] Rengasamy has told Sarawak Report he does not charge personally more than RM600 a month for growth hormone treatment, but cannot speak for other practitioners and has not himself treated the Prime Minister or his wife. Pension money benefitted just one ageing couple? It has been established that altogether some RM70 million was channelled into a series of AmBank accounts belonging to Najib between summer 2014 and early 2015. The world’s most expensive beauty product? Documents obtained from that MACC investigation show the outcome of enquiries by officials into some of the expenditures made from these accounts. However, what will leave Malaysians gasping is how two doses of serum and an oral product could possibly cost such a huge amount of money? What possible treatment could this involve? After some initial bafflement, Sarawak Report believes it has sleuthed the answer to this USD159,000 (X2) question. 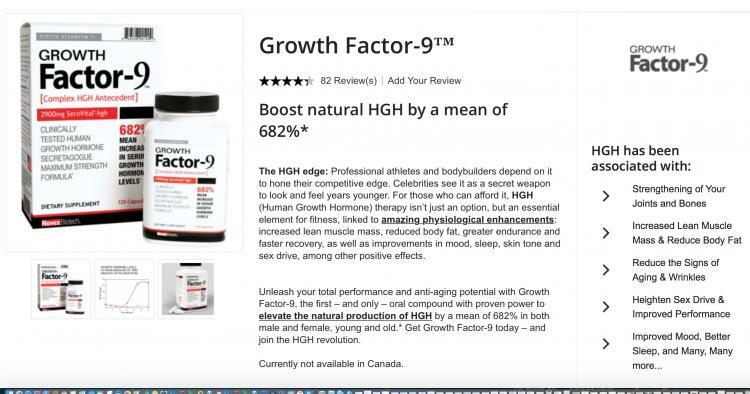 The most likely explanation is that the ‘GH-9′ description refers to the ‘Growth Factor 9′ hormone, which is being currently touted as all the rage as an anti-ageing product for the ‘super-rich’. The highly controversial drug is banned for athletes and illegal to prescribe in the United States, except for growth-related conditions. 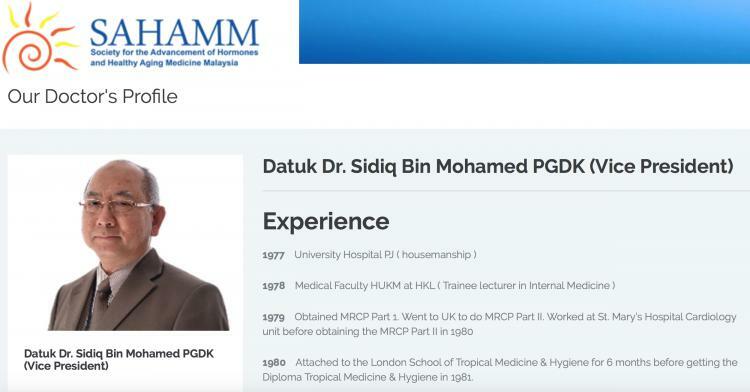 And we now believe we have tracked down Datuk Sidiq bin Mohammed as none other than the head doctor at the outfit that describes itself as a “Society for the Advancement of hormones and Healthy Ageing Medicine”, based in KL. Sahamm touts itself as an ‘alternative medicine’ centre, although of course hormone treatment involves the use of powerful conventional drugs. It is however highly unconventional to use human growth hormone to promote anti-ageing and physical strengthening. Doctors would certainly not prescribe such medicaments in conventional medicine. For athletes it is illegal and for anti-ageing it is not an approved use of the drug by the FDA – which is to say that it is also illegal to prescribe human growth hormone for anti-ageing purposes in the United States. Side-effects can be extremely troubling, including provoking physical and personality problems. Nevertheless, Sahamm boasts within its copious promotional online literature that it has the secret to bring “life to years and years to life”. Datuk B1 and his wife perhaps do understand the difference in meaning between “upstream medicine” and “downstream medicine”, which might to others appear to represent the abusive misuse of powerful drugs? MP SPEAKS | Damansara MP Tony Pua asked if “kleptocracy” is okay if the country can repay our debts. It seems that Pua has a reading problem, as he does not understand my original statement. My original statement called for Pakatan Harapan to no longer use 1MDB as an excuse not to fulfil their manifesto promises, or to continue their propaganda that the state investment firm will make Malaysia bankrupt and burden future generations to come. I am glad that Pua finally agreed that Malaysia can afford to pay back the 1MDB debt. Therefore, Harapan should follow Pua’s advice not to use 1MDB as an excuse. For the record, I have never said theft of any kind, including 1MDB, is okay and have always supported a full investigation. I was one of the MPs who voted yes for the Public Accounts Committee to reopen the investigations into 1MDB. Now we go back to Pua’s answers, one by one. Pua alleged that the BN government had in 2017 and early 2018 secretly paid RM6.77 billion of 1MDB’s debt, while the Harapan government had to further pay RM1.16 billion of the firm’s debt in 2018. How can this be a secret? As Pua and Finance Minister Lim Guan Eng confirmed, the assets of 1MDB had been transferred over to the Finance Ministry. As any student of accounting knows, you cannot simply transfer assets out without taking into account the loans associated with those assets. Since the Finance Ministry took the assets, then it should then pay for loans. This is basic accounting and logic. Pua said the loans remain at RM39 billion because 1MDB now owes RM7 billion to the Finance Ministry. Conversely, he should also answer on how much the Finance Ministry owes 1MDB for taking over the valuable TRX and Bandar Malaysia assets? Thank you for confirming that the national debt had increased RM95.1 billion (including RM7.3 billion samurai bonds) since the end of 2017, as well as the RM82 billion that the Pakatan Harapan government is taking from Petronas. Added together, that is a total of RM177.1 billion taken by Harapan through increased national debt and raided the RM170 billion cash reserves of Petronas left behind by BN. By saying that the Harapan government is running a bigger budget deficit than that of BN, Pua has also confirmed that the national debt had increased significantly and at a faster rate. Basically, Pua has proven that the prime minister and the finance minister were wrong in saying the national debt has reduced when it has increased substantially instead. To paraphrase Pua, How much of this RM171 billion had been taken by the Harapan government? RM177.1 billion is enough to pretty much wipe out the entire National Higher Education Fund (PTPTN) borrowings of around RM40 billion, Prasarana Malaysia Bhd’s debt of RM31 billion as at end-2018, 1MDB’s debt of RM39 billion, and still have RM60 billion remaining. However, not a sen of those debts had been reduced under the Harapan government despite taking so much money. Pua said he is eager to school me on how gross development value can be used to pay debts. No problem. Firstly, 1MDB still owns 40 percent of the RM180 billion Bandar Malaysia project, and the majority of the RM40 billion TRX project, including 40 percent of the Lifestyle quarter development in TRX. 1MDB is also owed roughly RM7.4 billion payment by the purchaser of the Bandar Malaysia project. As both projects develop, economic activity will take place. The government will collect its taxes and duties from these activities from the companies, workers, suppliers and buyers of properties in the project. The government will collect sales tax, corporate tax, personal income stamp duties and also the profits from 1MDB’s 40 percent share in Bandar Malaysia and its majority stake in the TRX project. These revenues can, of course, be used to pay off debts. Do you understand now? Pua says he is not the Almighty nor the All-Knowing, and cannot answer what is the total value of the two projects’ economic impact to our country. That is fantastic news, as it seems Harapan does not do any economic impact or feasibility studies whenever they approve projects worth tens of billions! Unbelievable. Then Pua and I are in agreement that both of these 1MDB projects are immensely beneficial to the country and our economy. Pua finally agrees that 1MDB is not all doom and gloom, but has its benefits as well. Therefore, my original statement stands. Harapan must no longer use 1MDB as an excuse not to fulfil their manifesto promises, or to continue their propaganda that 1MDB will make Malaysia bankrupt and will be a burden on future generations. WEE KA SIONG is the MCA president and Ayer Hitam MP. MP SPEAKS | MCA president Wee Ka Siong should answer the question as to whether 1MDB is the scandal which made Malaysia the kleptocratic capital of the world where tens of billions of ringgit was stolen, instead of attempting to divert attention to other unrelated issues. Wee was caught with his pants down giving valiant support to former prime minister Najib Abdul Razak’s 1MDB, claiming that the fund was “beneficial and played an important role in the development of the country”. When he could not reply to my critique yesterday, asking him even if the above were true, and the world knows it is not true, does it in any way justify the massive embezzlement which has taken place in 1MDB? Is Wee arguing that it is perfectly alright to be the world capital of kleptocracy, as long as Malaysia owns sufficient assets to repay what was stolen by its leaders? The MCA president avoided the question like a plague and attempted to divert the attention of the media and audience with half-truths and irrelevant questions. Unlike Wee, I will answer his questions, one by one below. However, let me repeat my question to him again – will the MCA president denounce Najib for embezzling, misappropriating and abusing tens of billions of ringgit which 1MDB borrowed with government guarantees, causing immeasurable loss to the reputation and tax-payers of Malaysia? Better still, will Wee apologise for his complicity in Najib’s cabinet for the scandal which rocked the world, and ironically caused BN’s historic loss in the last general election, while making Wee the sole representative for MCA in Parliament? Before I get to the questions, let me also address the diversionary snide remark Wee made in his attempt to discredit me. He tried to imply that I, “the person who said that SST will lower the price of goods”, had no locus “to school” him. Firstly, I never used the term “school” in my previous statement against Wee. That was the editorial headline used by The Malay Mail. I would not have used the term because some are just beyond “schooling”. Secondly and more importantly, like his Umno comrades, Wee relied on lies and half-truths to cast negative aspersions against their critics. In this case, he alleged that I had said that “SST will lower the price of goods” by intentionally failing to quote my speech in Parliament fully, when I argued that “the impact of SST on the price of goods will be lower than the impact of GST”. Would Wee like to argue that the price impact of GST is less than that of the SST? 1. What is 1MDB’s debt? Is it RM30 billion or RM39 billion? This question tells you why Wee was part of an incompetent cabinet complicit in allowing Najib to run 1MDB to the ground. He doesn’t even know what is 1MDB’s debt. As at Dec 31 2018, 1MDB’s debt amounted to RM39 billion. Perhaps, Wee was confused by the fact that RM31 billion was accounted in the government’s committed contingent liability because the BN gGovernment had in 2017 and early 2018, secretly paid RM6.77 billion of 1MDB’s debt while the Pakatan Harapan government had to further pay RM1.16 billion of 1MDB’s debt in 2018. However, 1MDB’s debt remains at RM39 billion because in the company’s balance sheet, the amount RM7.93 billion remains and is now due to the government of Malaysia. 2. Is RM30 billion higher or lower than the RM87.8 billion additional borrowing in sukuk since the end of 2017 – not including the additional RM7.3 billion in Samurai Bonds already issued plus the RM82 billion that the Pakatan Harapan government is taking from Petronas? 3. If RM30 billion is lower than those other figures I quoted then how can 1MDB continue to be the main reason why Harapan cannot deliver its manifesto promises or be the main cause of our future generation being burdened in debt? For Wee’s information, the government runs a budget deficit, a deficit the BN government has been running for the past 20 years. When the government is in deficit, it means the government will regularly issue bonds to raise funds to finance the deficit. The funds raised from these government bonds are used to finance the construction of schools, roads, hospitals and other development projects. So, the question is, what is Wee trying to imply here? He should perhaps stop beating about the bush and come straight to his point – that is losing RM30 billion to theft, in his opinion is immaterial and insignificant, and doesn’t affect government finances, since the government regularly issues bonds to finance its deficit anyway? It should also be pointed out to Wee that the actual ‘insignificant’ loss to the government from 1MDB is much higher at nearly RM40 billion as these losses has already been paid covered up by the Government (see answer to Question 1). How much is this RM40 billion? RM40 billion is enough to pretty much wipe out the entire PTPTN borrowings of around RM40 billion or Prasarana Malaysia Berhad’s debt of RM31 billion as at end-2018. 4. Can Pua confirm if the quantum of increase in national debt in 2018 and also so far in 2019 to date (RM36 billion) is higher than what had occurred under BN in the past? Yes, government direct debt has increased as expected as per the 3.7 percent fiscal deficit in 2018, and will increase per the 3.4 percent budgeted deficit in 2019. As explained by the Finance Minister in his Budget 2019 speech, unlike BN which hid its billions of debts off balance sheet in vehicles such as PFI Sdn Bhd, we are transparent and have them properly reflected in the books. Despite the increase in projected deficit, international rating agencies – Moody’s, S&P and Fitch, concurred with the move by reaffirming Malaysia’s single-A rating due to significantly increased transparency. The question again to Wee, are you criticising Harapan’s transparency while continuing to show support for the previous administration’s opaque attempt to hide debts off-balance sheet and to embezzle, misappropriate and abuse funds via entities such as 1MDB, Tabung Haji and Felda? Or perhaps you were so clueless that you didn’t know all the embezzlement, misappropriation, abuse and wastage were taking place in broad daylight while you were happily sitting as a minister in the Prime Minister’s Department with Najib? 5. When did I say that the entire RM180 billion is direct profit? How much is the land sale of Bandar Malaysia? What is the amount of taxes collected from these two projects with a GDV of RM180 billion over the course of its development? Let me quote Wee, so that he doesn’t accuse me of “spinning”. He pointed that Prime Minister Dr Mahathir Mohamad’s stated that Bandar Malaysia has a gross development value (GDV) of RM140 billion, while Finance Minister Lim Guan Eng had earlier said the Tun Razak Exchange (TRX) project has a GDV of RM40 billion. He is using the RM180 billion to deduct the 1MDB debt. That can only be possible if the RM180 billion is income to the government, which can only arise as the ‘profits’ of the two projects attributable to the government. How else will Wee’s sentence and allegation make sense? I eagerly await Wee’s attempt to school me on how GDV can be used to pay debts. 6. What is the total value of the two projects’ economic impact to our country? A country’s GDP is measured by the sum of all expenditure, or more technically, the monetary value of all the finished goods and services produced within a country’s borders in a specific time period. I must be pretty much an Almighty and All-Knowing to be able to give you an answer on this. Unfortunately, I’m not. However, perhaps you should direct this question to Najib? 7. And if those projects are not beneficial, then why continue them? 8. Is Finance Minister Lim Guan Eng also wrong to say that the RM40 billion TRX project is one of our country’s best asset or that Prime Minister Dr Mahathir Mohamad was also wrong to say that the Bandar Malaysia project will contribute immensely to our country’s economic development? Again, Wee is trying to be disingenuous and put words in our mouths. We never said the two projects are not beneficial. We are saying that firstly, because of the 1MDB scandal – the two projects were stuck and could not in any way reach their full potential. However, with the change of government and detoxification of these projects from being tainted by 1MDB, we can now work towards fully realising the value of these two projects. Secondly, while these two projects would certainly bring revenue to the government, 1MDB cannot claim credit for them because the government had sold these two parcels of land to 1MDB for a song, and hardly developed them when in their ownership (read my earlier statement). Thirdly, by right, the revenue for these two projects should be added to government coffers and be used to further develop the country. However, because of the 1MDB scandal and RM39 billion of debt incurred, the likely proceeds from these two projects are nowhere near enough to repay 1MDB’s debts (also in my earlier statement). You have accused numerous times in the past that the true cost of the ECRL project is only RM29 billion and that the BN government had inflated the cost to RM55 billion. Wee has the cheek to even raise this question. BN signed the contract for RM66 billion. With our hands tied behind our back in our negotiations with China, after the BN government has already paid the Chinese companies nearly RM20 billion, we had successfully reduced the cost by a-third to RM44 billion. This is an achievement no other country in the world has done with China. Instead of hanging his head in complete shame for having approved the contract at RM66 billion, Wee is trying to win political brownie points by criticising the new government for saving ‘only’ RM22 billion. TONY PUA is the MP for Damansara and political secretary to the finance minister. Let me ask him a few questions and see if he is smart enough to school me. 2. Is RM30 billion higher or lower than the RM87.8 billion additional borrowing in sukuk since the end of 2017 – not including the additional RM7.3 billion in Samurai Bonds already issued plus the RM82 bilion that the Pakatan Harapan government is taking from Petronas? Please note that it was the Harapan leaders who alleged the country might go bankrupt due to the debts of1MDB amounting to RM30 billion without taking into consideration the assets owned by 1MDB including land for TRX and Bandar Malaysia which can generate much higher GDV if developed as well as the income to the government and the positive economic impact to the people. On a final note: You have accused numerous times in the past that the true cost of the ECRL project is only RM29 billion and that the BN government had inflated the cost to RM55 bilion. The Harapan government have now stated the ECRL project now cost RM44 billion despite cost reductions of more than RM10 billion from avoiding the costly tunnelling works along the mountain range and thus dropping the Bentong and Gombak stations. Are you prepared to issue a statement of apology now or do you still stick with your stand that ECRL’s true cost is still RM29 billion and that the PH government had inflated the price to RM44 billion? 3.25pm – Members of the public and the media inside the courtroom are in stitches after an incident occurs when Sim is asked by DPP Saifuddin if she can identify Najib in the courtroom. DPP: Have you met Datuk Seri Najib (before)? Sim: Yes, but always in a group of people sitting together. DPP: Do you see him in court today? Sim: Where should I look? She is directed to look at the accused’s dock, before positively identifying the former premier. Sim: Yes, yes, I see Datuk Seri Najib. However, after answering the DPP’s question, Sim continues to look towards Najib, before asking the DPP whether she should continue looking at him. 3.10pm – The prosecution calls its 14th witness, Rita Sim, who is the director of a media monitoring company named Centre for Strategic Engagement Sdn Bhd (Cense). She testifies during examination-in-chief by DPP Saifuddin that her company conducted media monitoring and analyses on reports by six Chinese newspapers for the Prime Minister’s Office (PMO) during Dec 2014 and Jan 2015. The company was paid a total of RM300,000 – or RM150,000 a month – for the services rendered. This involved sending daily summaries of newspaper reports via Whatsapp to the media office of the PMO. A cheque for RM300,000 made payable to Sim’s firm had been verified last week by Ambank employee Badrul Hisham Mohamad as originating from an Ambank account linked to Najib’s SRC International trial. The director explains the services her firm provided to the PMO. Sim: We looked at Chinese dailies every single day together with websites, and picked up issues that affect Chinese communities, and then summarised it daily, and sent it to the media office of the PMO. We sent this daily analysis to the office of the PMO. DPP: So what form was this analysis in? Hard copy, or what? Sim: (It was) done and sent daily via Whatsapp, with weekly analysis by email. And monthly report. DPP: So the monthly report was also sent by email? Sim: It is actually a summary of the weekly report. DPP: So you said you monitor the six Chinese newspapers? DPP: Can you name them? Sim: Sin Chew, Nanyang Siang Pau, China Press, Guang Ming Daily, Kwong Wah Jit Poh, and Oriental Daily. In her testimony, Sim also mentions that her company had been engaged by Najib’s former adviser, the late Jamaluddin Jarjis, to provide the services mentioned to the PMO. DPP: From whom did you get this instruction to conduct this monitoring? Sim: This instruction was given to us by the late Tan Sri Jamaludin Jarjis. She also testifies that her company had received payment via its RHB Bank account, which had been opened at the bank’s Bangsar branch. 3.40pm – Sim says the BN-led government engaged her firm in 2015 to gauge and formulate policies based on the sentiments of the Chinese community. During cross-examination by defence counsel Shafee, Sim says the government wanted to understand what issues affected the community. She notes that Najib’s then adviser Jamaluddin, who was present at meetings between her staff and the PMO’s Media Office in Putrajaya between late 2014 and early 2015, had wanted to know why the Chinese community appeared to be anti-government. “The Chinese community should be the concern of all political parties, not just BN. “The government of the day must derive policies for the Chinese community as the community is part of Malaysia,” she says. She tells Shafee that education and the Unified Examination Certificate are among the issues that concern the community. Sim states that Chinese Malaysians also want the middle-income trap, which affects most members of the community, to be addressed. “I am a Malaysian. I love my country, I am nationalistic,” she says, adding that she is uncertain whether the government took the advice contained in the report the company submitted to it in 2015. LIVE | #NajibTrial 2.44pm – Najib has arrived at the High Court in Kuala Lumpur. Clad in a black suit, he walks into the courtroom and sits down in the dock as Justice Mohd Nazlan also enters the court to begin proceedings. Lawyer Arun Kasi has been handed a 30-day jail sentence after he was found to be in contempt of court over his statements pertaining to a court judgment. The Federal Court also handed the lawyer an RM40,000 fine. Arun was accused of making contemptuous statements online, in relation to the Federal Court’s decision to expunge a dissenting judgment by Court of Appeal judge Hamid Sultan Abu Backer in the case of Leap Modulation Sdn Bhd vs PCP Construction Sdn Bhd. Arun had previously asserted that his comments constituted fair criticism. PUTRAJAYA: Lawyer Arunachalam Kasi, better known as Arun Kasi, who wrote two articles critical of a court judgment in February, has been found guilty of scandalising the court. Ramly Ali, who chaired a five-member Federal Court bench, said Attorney-General Tommy Thomas had proved his case beyond reasonable doubt against Arun. “In our view, on an objective assessment, his statements scandalised the court and undermined the judiciary,” said Ramly who delivered the judgment today. The bench has reserved sentencing pending mitigaton by Arun’s counsel. Lawyer Arun Kasi….has vowed to challenge contempt proceedings brought about by Attorney-General Tommy Thomas against him. This came after the Federal Court on Wednesday granted leave to Thomas’ application to initiate the proceedings over statements Arun made online pertaining to a court’s decision over a particular case judgment. Defending his action, Arun, in a statement today, maintained that his remarks constituted fair criticism. “I have always stood for, and will stand for, truth and justice without fear or favour. It is my view that every lawyer should stand to uphold the cause of justice. “There is a difference between contempt and fair criticism. Contempt will lower the bar, while fair criticism will raise the bar. “I will take the position that my two articles did not border on any contempt, but were merely fair criticism of the process by which the decision in question was made,” his statement read. Arun said he expected the Bar Council to make a stand on the matter. The attorney-general initiated the contempt proceedings after Arun remarked online on the court’s decision to expunge a dissenting judgment by Court of Appeal judge Hamid Sultan Abu Backer in the case of Leap Modulation Sdn Bhd vs PCP Construction Sdn Bhd. Senior federal counsel Amarjeet Singh said in the application that Arun’s remarks had scandalised judges and the court. The former cited two articles written by Arun, published on an NGO’s website, criticising the Federal Court for expunging Hamid’s judgment. IT will be difficult to solve the problem of interference from the Malay rulers in government affairs but Prime Minister Dr Mahathir Mohamad said it can be done if the government has two-thirds majority in Parliament. “It is a difficult problem, I must say, but I try,” the prime minister said in an interview with The Star today. He said he had done that (amending the constitution) to curtail the powers of the rulers in 1993 but the difference then was that the government had a two-thirds majority. “We do not have a two-thirds majority (now). We need the support of the opposition in order to amend the laws. And the opposition is not always forthcoming,” he said. Saying that he was not anti-royalty, Dr Mahathir said part of the problem for the continued interference from the palace in government affairs was due to administrators and politicians failing to say to the rulers, “this is wrong”. “We find reluctance on the part of everyone to point out that this is wrong. “For example, if the ruler takes land, confiscates land and all that, this has to go through the administrative process. The administrators dare not refuse. So, land has been taken away from the people, wrong things were done – things that were against the law. He also said there are cases of state executive papers having to be endorsed by the palace when it should not be allowed. It is the mentality of the people that this is sacrosanct and this is something above us and we cannot say no, even if wrong things are done. “I have tried to correct before but they have gone backwards. For example, we set up a special court for the rulers. It was only used once (since 1993) but after that, it has never been used. “Suppose, somebody has been punched, it does not got to the court, even though they make reports. People think they will get into trouble if they do not comply,” he added. He attributed this to a combination of fear and respect. To overcome this situation, the prime minister said he is trying to solve the failure by following the federal constitution but admitted he is facing challenges in that effort too. He referred to the way the Rome Statute issue was handled, especially by the Malay rulers, forcing the government to withdraw from ratifying the treaty. “I have been blackened by other things such as (what was) done on the Rome Statute. To blacken my name so that I would not be influential, so that I can be overthrown. This is ongoing. Dr Mahathir also touched on the royalty being involving in businesses when they have been told from the time of Tunku Abdul Rahman that they could not do business. “There is some evidence (that) they (the royalty) allow their names to be used by private business people as a front. He also said that the rulers are assuming more power than what was given to them under the constitution, pointing out at the appointment of a new chief justice to replace Richard Malanjum. “I always imagined that the King is the person who must approve all senior appointments but somehow or rather, there is the reference to the Conference of Rulers. Now, it is not just the King but it also has to go to the rulers. LIVE | #NajibTrial 11am – Asmadi testified that he first became the division chief in 2013, and had received a RM50,000 cheque from Najib when he met the then Umno president in 2014. 11am – Hearing resumes after a short break with the prosecution calling in their ninth witness, Umno Padang Serai division chief Asmadi Abu Talib, who is also a former teacher. Asmadi testifies that he first became the division chief in 2013, and had received a RM50,000 cheque from Najib when he met the then Umno president in 2014. The witness said he met Najib at Umno’s office in Putra World Trade Centre. Asmadi said he spoke with Najib about his experience of being a division chief for the first time, and discussed constraints in conducting party programmes for his division, including financial issues. “Datuk Seri Najib then gave some advice to lift up my spirits, and then he handed over some contributions to assist my division to execute party plans,” he told the court during examination by DPP Muhammad Saifuddin. Asmadi said the cheque was made payable to him, and was later deposited into his Maybank account before being used to organise programmes for non-government organisations and associations. KUALA LUMPUR: The High Court here today warned the defence and prosecution teams in Najib Razak’s SRC International trial against circulating court recording and transcription (CRT) videos on social media. Judge Nazlan Ghazali made the order after fiat prosecutor V Sithambaran said a video on the trial had been uploaded to Facebook last week. “No form of recording should be uploaded online, including the CRT video,” he said, adding that the police are investigating the matter. 10am – Nazlan says that the court will not rule on whether the uploading of the CRT from Friday’s proceedings constitutes contempt of court, as the matter is now the subject of a police investigation. However, he reminds both the prosecution and the defence that as officers of the court, they must abide by their undertaking when handling the CRT. The judge tells them that the CRT recording is only meant to assist both sides in the transcription of proceedings, and not for use in an unauthorised manner, such as being uploaded onto social media. “Any transgression may result in the court no longer providing the CRT (to both parties). “At the same time, everyone is reminded not to make prejudicial comments on the ongoing trial, including analysis of evidence and witnesses, that may prejudge the issue for determination before the court, which may constitute contempt of court. “It is important that the matter does not detract the court from hearing the trial,” Nazlan rules. 9.45am – Shafee (below) says the dissemination of recordings of court proceedings is normal practice in the United Kingdom, and that copies of these videos can be accessed in the national archives. Sithambaram stands firm, however, and insists that spreading the CRT is wrong and affects the court’s integrity. Shafee replies by saying that the CRT should be made public to avoid biased reporting. 9.30am – Harvinderjit backs his co-counsel Shafee, asking why uploading of CRT recordings are wrong when the media gives the public minute-by-minute updates of the trial. “What is the difference between media recording (reporting) this minute-by-minute, and the recording of the video (of Friday’s proceedings)? “The video is not the entire video (of the day’s proceedings), but excerpts from the cross-examination of the two witnesses,” he argues. 9.20am – Day six of the trial begins, with DPP Sithambaram raising the matter of the court recording transcript (CRT) videos that were uploaded onto social media last week. The prosecution asks for court direction on the leak, with Sithambaram (below) pointing out that CRT footage can only be obtained by signing an undertaking not to forward the copy to other parties, nor upload it onto any medium. PETALING JAYA: PPBM’s Anina Saadudin today dismissed an allegation by a fellow party member that she had received RM7 million from Najib Razak to rejoin Umno, adding that it was malicious. Anina, who also sits on the newly-formed party’s supreme council, said the allegation was an attempt to tarnish her credibility as a politician. The former PPBM women’s chief said she would not stand for such things and had lodged a police report against the party’s Langkawi division secretary Puteri Fataharyati Harun, who had initially made the claim. “I’m not going to play victim to such slander. It’s time I spoke up,” she told FMT. Fataharyati had on May 31, in a Facebook post, called Anina desperate for taking Najib, who is also the Umno president, to court and alleged that she had received RM7 million to jump ship. Anina, who was a former Langkawi Wanita Umno member, last year filed a suit against Najib over the controversial RM2.6 billion donation he had received. Attorney-General Mohamed Apandi Ali in 2016 cleared Najib of any offences pertaining to the RM2.6 billion donation, which he said was from the Saudi royal family. Anina, who was among PPBM’s founders, also urged Fataharyati to lodge a complaint with the party’s disciplinary board and the Malaysian Anti-Corruption Commission instead of making wild allegations. PPBM, she added, should not condone such behaviour. She also denied speculation that Fataharyati’s actions were fuelled by revenge, adding that they had never had any problems before. BANGI: Anina Saaduddin, who helped set up PPBM but later quit the party, today sued six PPBM members for defamation for claiming she received RM7 million from Umno. She filed the lawsuit after the six failed to apologise and retract their allegation posted on Facebook in May. Anina said she was taking legal action after her complaint to the PPBM disciplinary committee, submitted on Aug 2, was not acted on. The defamation suit was filed at the Shah Alam Sessions Court yesterday, she told a news conference at her residence today. However, she declined to name the six until after the notice of summons had been delivered to them, but acknowledged four of them were leaders of PPBM Langkawi. Anina was a member of the Langkawi Wanita Umno until she was sacked in 2015 for suing Prime Minister and Umno president Najib Razak over political donations he received. She made a police report on July 18 on the allegation that she was paid RM7 million by Najib to return to Umno. She also made a similar report to the Malaysian Anti-Corruption Commission.